For almost 50 years, the United Nations has tried to hold multinational companies (MNCs) responsible for human rights, without success. 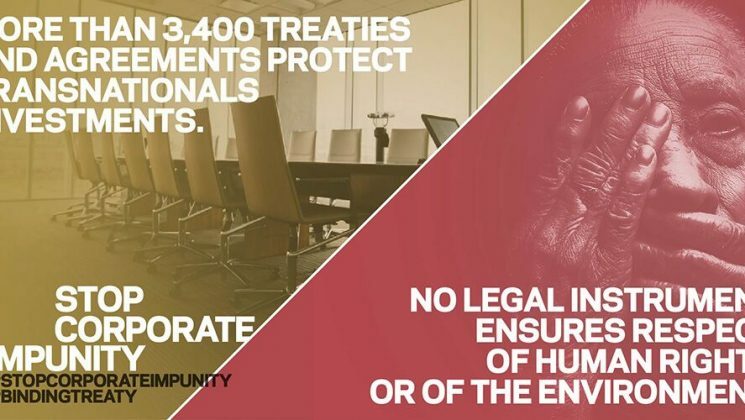 This is because the only globally binding laws on corporate power are trade rules and these place protection of the profits of MNCs above the rights of people and the environment. After three years of preparation, a UN Human Rights Working Group just concluded its first round of negotiations on the text of a globally binding treaty which could actually hold MNCs to account for their human rights abuses – a bit like an international criminal court. UNISON took Labour’s Shadow Foreign Affairs Minister Helen Goodman MP to the meeting to provide solidarity and lobby the UK Government to support the Treaty. And we plan to work closely with British civil society to get strong public awareness and support for the Treaty. You can find our paper here. Please help us grow support in the UK for the Treaty by writing to your Member of Parliament, MEP and/or your local councillors, Council Leader or Mayor and urge them to sign the Call of people’s representatives Worldwide. You can find a model letter here.